This is an easy walk that can be undertaken at any time of the year, by people and children of all abilities, as well as wheelchair users and cyclists (from the Llandudno west shore car park, follow the estuary cycle path, which should now be repaired after winter storms. It’s 99.9% along level ground, with just 0.01% over a railway bridge (no steps, just a gentle gradient) into the large RSPB reserve at Conway. The RSPC offers free guided walks (usually 11.00am on Saturdays) and the birds change with the seasons. The route passes the sand dunes where the BBC logo with circling red kites was filmed, the Maesdu golf club, the North Wales golf club and Deganwy hotel and marina. There are views over the river to Morfa marina, Conway golf club, Conway Mountain and Anglesey. And as you pass over the railway, you can look over to Conway’s castle and suspension bridge. Passing through the tubular railway tunnel into the reserve, walkers enjoy the outstanding views of Snowdonia. To top it off, there’s large visitor centre and café, and large birdwatching hides positioned all around the reserve. Of my 67 walks on the Car Free Walks website, this is my second favourite. 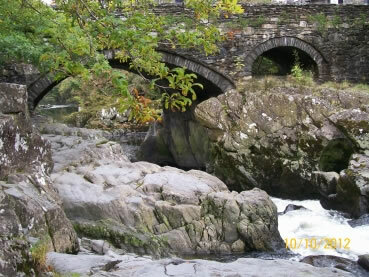 It starts from Betws-y-Coed station, and then follows the edge of the golf course along the river Llugwy to its junction with the river Conway. Next, it follows the river Conway, still along the edge of the golf course. You cross the river and leave the golf course past the church to the first of the four bridges, the ‘Sappers Pedestrian Suspension Bridge’ – so named because it used to connect to an old army camp which is now based further up the Llugwy valley. It was built by David Powell Engineers of Westminster in 1930. Turning right at the main road, you pass the waterfall on your left to the second bridge – the ‘Waterloo Bridge’. Construction started in 1815, the same year as Battle of Waterloo, and it was built by Telford. Crossing the bridge into town, you come to the stone Pont-y-Pair over the river Llugwy, our third bridge, and then head left into Coed-y-Mynydd – ‘Mountain Wood’ – where there is a circular boardwalk allowing "all abilities i.e. disabled / wheelchairs" to reach the large picnic area in the woods by the river. Still following the river Llugwy, you encounter an area of boggy ground and tree roots just before the fourth bridge – The Miners' Bridge – named after their walk to and from work in the old lead mines. Walk down to the bridge, then up the steps, to the main road and on to the entrance to Swallow Falls. This is one of the most photographed stretches of water in North Wales, featuring on postcards, calendars, and in guidebooks. After visiting, you can relax with some well-deserved refreshments just over the road in the Swallow Falls Hotel. I think everyone knows Llanberis as the starting point for the most popular of the paths up Snowdon, but not everyone is aware of the attractions of the town’s lake, which can all be explored on a day’s walk. The visitor centre and cafe is the entrance to ‘Electric Mountain’: water from the lake is pumped at night, using off-peak electricity, to the reservoir high above. Then, when there is high demand, e.g. at the end of Coronation Street or a big football match, they open the reservoir to let the water back down to the generators to cope with the spike in demand. You can book a minibus trip and guided tour of the workings at the visitor centre time (slots are at a premium on busy days). Llanberis has other attraction. At the Slate Museum, besides the history of the machinery of the quarries, you can see how to split a slab of slate to make some roof tiles. There are landing stages for boat trips on the lake – one is steam powered ­– and a lakeside railway, which has stops at various picnic sites on route. There’s a sub-aqua diving centre in one of the now flooded open cast quarries, Dinorwic Wood and, at end of the lake, an engraved plaque detailing the visible (on a clear day) mountains of Snowdonia. You can return via the old bed of a long-gone railway track, past Dolbardarn Castle. But don't get too excited – it’s just a ruined circular tower these days. This classic, challenging walk is one for mid summer, when the days are long. If you want to experience the heritage steam/diesel railway line to Carrog (with an extension to Corwen well underway) or the world heritage Pontyscyllte Aquaduct, you might need to plan an overnight stay. 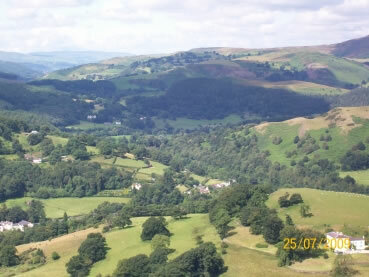 It’s a day with scenic variety and historic interest, with stunning views of the Vale of Llangollen and the Berwyn Mountains. The start involves a steep climb to the remains of Castell Dinas Bran, followed by descending onto a path below the limestone cliffs of Eglwyseg. It continues round to Valle Crusis Abbey, over Velvet Hill through high bracken to the Horseshoe Falls on the river Dee, the source of and level-limiting water for the Shropshire Union Canal. You end the day by following the towpath back into Llangollen. This short stroll is one for the families out there, even with very young ones (on the day I went, there were quite a few families with pushchairs). 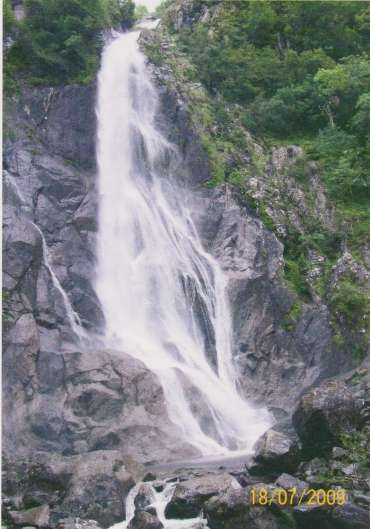 The waterfall is named after the nearby village of Abergwyngregyn – meaning ‘the River Mouth of the White Shells’ – which has been occupied since the Bronze Age. This was where Llewelyn ap Iorwerth, also known as Llewelyn the Great, had a palace. 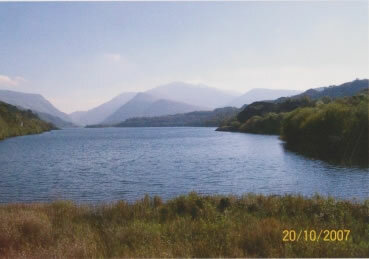 It was also a favourite place with the Princes of Gwynedd. The river valley has a variety of trees in its woodlands, and a selection of bark-loving lichens and mosses. The birdlife may include mountain birds like ring ouzel, wheatear and raven, as well as woodland birds like dippers and grey wagtails, while you might spot buzzards overhead. On the way, you will pass a small visitor centre, which has information on the local history and examples of tree ageing, as well as a small example of a charcoal kiln and local archaeologists working on excavations of the old palace area. Finally, the falls; on a nice day, relax with a picnic before heading back, or, if without children look for other waymarked paths, or follow the route over Conway Mountain.